I-696 road closures begin Monday morning in Macomb County. MACOMB COUNTY, Mich. (WXYZ) — Drivers in Macomb County should expect delays getting around metro Detroit starting Monday morning. 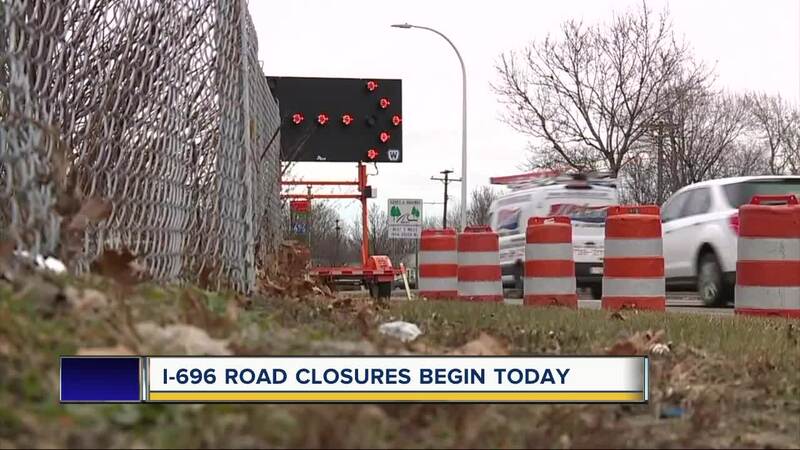 Construction work on I-696 will resume at 9 a.m. following the morning traffic rush, according to MDOT. The right two eastbound lanes of I-696 will be closed from Mound to Gratiot so crews can improve the roadway with diamond grinding, which will make the road smoother. The long-term I-696 repair project between Dequindre Road and I-94 includes restoring crossover locations, repairing barrier walls, freeway lighting, and joint sealing among other things. “Because of the different types of work which is normally done when the roadway’s closed and you can work in different spots, we will be shifting the lane closures all around," said MDOT spokesperson Diane Cross. By the weekend, lane closures will switch to the eastbound left lanes so diamond grinding can continues there. A single lane will also be closed on the westbound I-696. Lane closures will be continuously changing this spring as crews work. Cross said the project is expected to finish late this summer.